The residents of Ramteerth Nagar locked the BUDA office and staged demonstrations at the BUDA office this morning. The residents who gathered at 10 am locked the BUDA doors at 11 and doors were locked for an hour. Later Addl DC had to come to hear the grievances and gave an assurance that all the demands made by the residents are genuine and work for smaller infrastructure works will be taken soon and we will discuss the entire problems in details in a meeting after independence day. Ramtirth Nagar layout, with 4,082 housing plots, was perhaps one of the largest layouts by area in the State. Although it was built 14 years ago, there were no proper streetlights, roads, underground drainage lines nor regular drinking water supply. 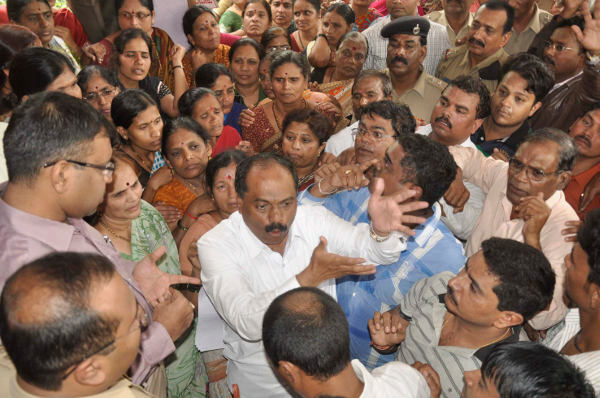 The residents who were present in large numbers demanded they get the basic facilities which they are bound to by the BUDA and city corporation. Form the past 15 years the area has been neglected the residents said.